"OTCC-Baked Penne with Sausage, zucchini and fontina cheese" - Reality TV World Message Board Forums - "OTCC-Baked Penne with Sausage, zucchini and fontina cheese"
"OTCC-Baked Penne with Sausage, zucchini and fontina cheese"
Hey all! I can't believe I was able to make it here today, what a week! Long story short, I had a virus in my computer the past 2 days and it wasn't working. Got it cleaned up last night! I have had this recipe since the summer when I signed up and did not realize what a week this was. Today is my mother and son's birthday and I have not done any cooking for the past 2 weeks due to the holidays. So unfortunately I do not have any pictures. I hope to make this next week and add some pictures. 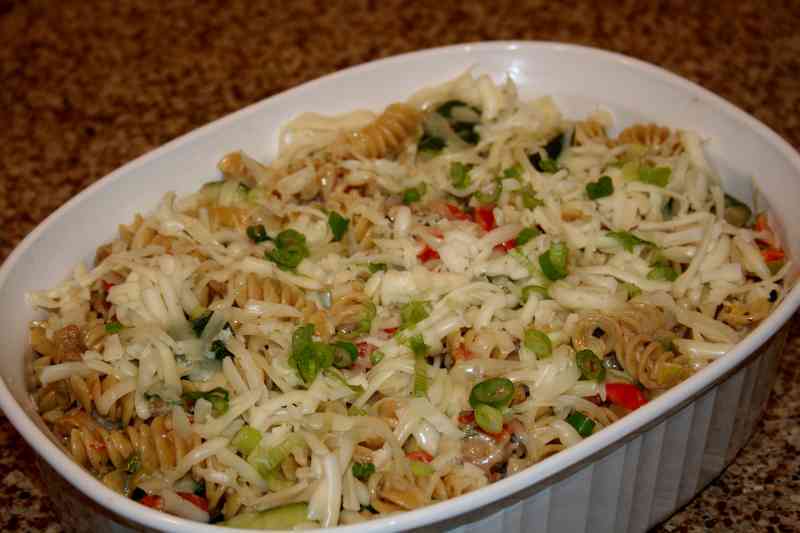 It's a basic casserole recipe that I loved the flavor combinations in this original one. It's warm comfort food for this time of the year. I mostly am interested in all of your tweaks and what combos with exotic flavors you can add! My kids love it as well. As with everything measurements are just a guideline! 3. Heat oil in large skillet over med heat. 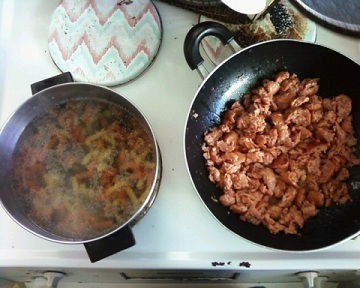 Add sausage, breaking it up with fork until no longer pink. When cooked transfer to bowl. 4. Add onions to skillet until softened. Add zucchini to onions, season with salt and pepper and saute until almost tender. 5. Return sausage to skillet. Add cream and oregano and bring to a boil. 6. Add half of grated fontina cheese to sauce and stir just until melted. 7. Meanwhile prepare your pasta, drain your pasta and return to pasta pot. 8. Add sauce to pasta and stir to coat. Taste and adjust any seasonings. 9. Transfer to casserole dish. Top with remaining cheese and bake at 350 deg. until heated through about 15 min. Note, I usually double this because 4 servings will not feed us. You can make it a day ahead, it tastes so good after a day of sitting! 1. "RE: OTCC-Baked Penne with Sausage, zucchini and fontina cheese"
I have not tried any other cheese, so I am interested in suggestions there. I have tried milk instead of cream and something went wrong there. It was not good, maybe someone else would have better luck. We have paired this with a simple salad and garlic bread. Kids really like it and it is easy. I am sorry about lack of pictures. As I said before I have not cooked for 2 weeks and probably won't be cooking this until late next week. 2. "RE: OTCC-Baked Penne with Sausage, zucchini and fontina cheese"
This will be a great week night recipe and I love fontina cheese. Looking forward to making it this coming week! 3. "RE: OTCC-Baked Penne with Sausage, zucchini and fontina cheese"
I've already decided to add the garlic and some shaved brussel sprouts to the onion/sausage mixture. 4. "RE: OTCC-Baked Penne with Sausage, zucchini and fontina cheese"
I will try this but will sub sweet for hot Italian sausage as I cannot do spices with my acid reflux and since Fontina is nearly impossible to find here in any bulk form I may substitute with Edam or Goulda. 5. "RE: OTCC-Baked Penne with Sausage, zucchini and fontina cheese"
I think I'll try it too. Except I'll substitute Hamburger helper for everything except the sausage, and use hamburger instead of sausage. Just kidding. Does sound great, mouth watering in fact, I really would like to try it, just as is. 6. 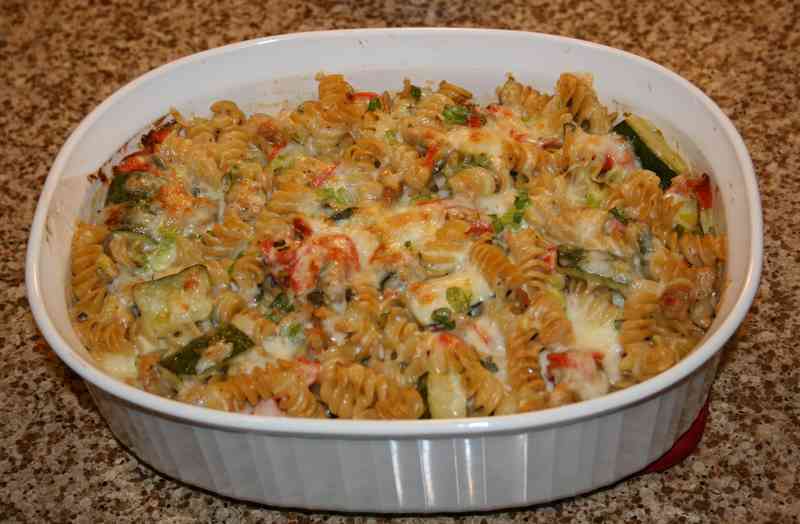 "RE: OTCC-Baked Penne with Sausage, zucchini and fontina cheese"
Wow - can't wait to try this! 1) I used Rotini as I didn't have any Penne and the lines at the store were far too long (but I tried to get the right thing). 2) I cannot have hot/spicy things so I used Smoked Keilbasa. I also added roasted garlic, regular garlic, the grape tomatoes sliced in half and black olives. I had doubled the recipe and only had a 1/2 LB of Fontina (I actually had it at home, forgot I bought it at Safeway last time I was there--it's the Gouda I can't seem to locate) so I used 1/2 pound of Monterey Jack I had and mixed the 2. 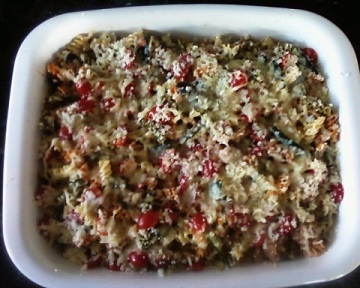 In casserole dish before cheese, isn't it pretty? I didn't get pics of "out of the oven" or plated as I had called my brother to see what time he wanted to eat and he and his lady friend were walking to Tony Roma's. They said they would come back and they did, so once I pulled it out we started to eat right away. I paired it with garlic/Parmesian cheese french bread. My brother isn't really a vegatable kind of guy but he loved it. His friend also asked for the recipe and said she would add capers. I have 1/2 left over and am going to share it with my visiting Canadian friends. I had some for lunch today and it was marvelous. I just want to know if this would freeze well? Thank you all for getting me into the kitchen again--it's been years and I had excellent reasons for hating cooking. Still love baking more but this dish was so wonderful, I'd do it again. I used a variety of different cheeses we had hanging around (everything BUT fontina -- marble, applewood smoked cheddar, goat gouda, asiago, emmental, havarti, to name a few.) and added red and orange peppers, mushrooms, tomatoes and spinach to the sad, sad looking zucchinis (there much have been a zucchini freeze; the four stores I went to had pathetic looking zukes.) Since I used sweet italian sausage, next time I might add a couple of dashes of hotsauce to the cream. I like woe's idea of using rotini -- I think the swirls would catch the sauce really well. DD is a fan and DH will be home soon, I know he is going to love it too. I like your idea of the red and orange peppers and I would probably add the yellow, too. It was so good and the possibilities are endless on what you can add to it, I think. I grated a hard cheese it there, too, just don't remember what it was. Might have been Ramano? Does anyone have a recommendation for a brand of VEGETARIAN italian style sausage? Bravie has inspired me to get back to my "at least two nights a week" meatless dinners. I have to be sneaky for Nolay not to complain about it. ETA: Due to bad experiences with Boca products, I refuse to waste more money on them unless someone tells me I must. I've tried a few Morningstar products with more success, but that's about it in the meat-like non-meat product department. 11. "RE: Question for OT"
Does Nolay require that there be a meat-like substance in there? Could you substitute more veggies or beans for the sausage (and add in some sausage seasonings like fennel, garlic, red pepper flakes to keep the sausage flavor without the meat? 12. "RE: Question for OT"
Hmmm, good idea about adding the sausage flavors without the meat and maybe some white beans for protein. I guess I'll see what the grocery store brings tonight. If there's a decent looking veggie sausage, I'll try it. If not, I'll punt. 14. "RE: Question for OT"
13. 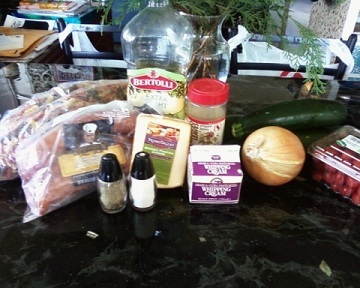 "RE: OTCC-Baked Penne with Sausage, zucchini and fontina cheese"
Looks like a great recipe! I'm not a fan of zucchini, but will make it as is otherwise. The kids love sausage, so this looks like a good bet to pass their 'quality control' approval. 17. "RE: OTCC-Baked Penne with Sausage, zucchini and fontina cheese"
I am actually thinking of subbing the zucchini with spinach. I like zucchini, but I am alone. 15. "RE: OTCC-Baked Penne with Sausage, zucchini and fontina cheese"
Ok, I have to ask - when you say "edges trimmed", do you mean the ends? 16. "RE: OTCC-Baked Penne with Sausage, zucchini and fontina cheese"
To be honest I have no idea! I copied that one from the original recipe LOL. I cut off the both ends of the zukes. I guess that's what it means. I don't peel them or cut the skin away. right now to be re-heated again for tonight since I have an appointment at dinner time. I took pictures and hope to post later. At the market the pickings were slim with regards to veggies. I only got one zucchini since all the others looked icky. I got scallions and red onions. I looked for leeks and weirdly could not find any. Other sub was I used bowties instead of penne. The fresh garlic I used was so fragrant! It smells so good and I sampled some pre-oven, it's a good one tonight! I stuck pretty close to the recipe, just less zucchini and lots of onions. The garlic is really great for some reason today! 19. "RE: OTCC-Baked Penne with Sausage, zucchini and fontina cheese"
Picked up the stuff for this today on my lunch break, and will be making this tonight. My son has already informed me he will not try it because it has zucchini, and when asked about any other veggie so I could subsitute, was not helpful. I do know that if I like it, I will be using a different cheese in the future, because fontina was a little pricey (for me, anyway). 20. "RE: OTCC-Baked Penne with Sausage, zucchini and fontina cheese"
I decided to use mushrooms instead of zucchini so Nolay wouldn't b!tch. ETA: Making it this weekend, so I actually can't verify this prevents his b!tching. 21. "RE: OTCC-Baked Penne with Sausage, zucchini and fontina cheese"
Son doesn't like mushrooms, either. But that does sound good to me! 22. "RE: OTCC-Baked Penne with Sausage, zucchini and fontina cheese"
I was just thinking about mushrooms as I read your first post. 23. "RE: OTCC-Baked Penne with Sausage, zucchini and fontina cheese"
Made it. It's really good. I added garlic, mushrooms and shredded cabbage that I browned with the onions and sausage. Fontina was pricey for me also, so would like to hear if anyone subs a different cheese. I googled fontina substitues but nothing sounded right. I found only 1 zuke that was worth buying. 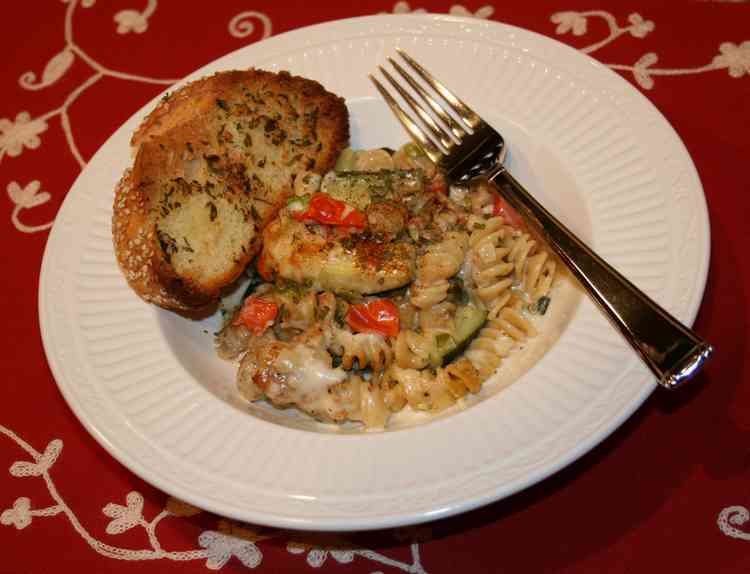 I am going to remember this recipe this summer when my garden overflowesth with yummy zucchini! I also made Tribe's Hot Pink Beets. I liked them but I'm the only one that did. I'm going to make the fresh ricotta to go in a lasagne this weekend. Wish me luck! 24. "RE: OTCC-Baked Penne with Sausage, zucchini and fontina cheese"
I would think for cheaper cheeses, provolone might have the closest flavor and would melt just fine. I am the midst of a fontina love affair, so I think it's worth the cost. 25. "RE: OTCC-Baked Penne with Sausage, zucchini and fontina cheese"
I paid $5.99/lb. What does it cost for everyone else? I've used this recipe before with subs and this time I kind of stayed true to the recipe and this last one came out really good. I'm all for subs,especially if you don't like an ingredient but this time the combo of the sausage, zucchini and fontina cheese is really good. DH wants me to add red and green peppers next time. Had it for lunch today and it was just as good. I promise to upload pictures soon! 26. "RE: OTCC-Baked Penne with Sausage, zucchini and fontina cheese"
If you would quit play Bubble Witch, you could upload a picture or two. 27. "RE: OTCC-Baked Penne with Sausage, zucchini and fontina cheese"
LOL, I don't know how to get the pics off of the camera. I am at DH's mercy. 28. "RE: OTCC-Baked Penne with Sausage, zucchini and fontina cheese"
I paid $6.49 for 9 ounces. The store I went to only had two brands, and the other was $7.59 for 8 ounces. 32. "RE: OTCC-Baked Penne with Sausage, zucchini and fontina cheese"
I pay almost 11.00 a pound here, but I agree with Weltek, I love it and find it worth the cost. 38. "RE: OTCC-Baked Penne with Sausage, zucchini and fontina cheese"
It was 8.99 lb here which was more than a T-bone steak. I like cheese but I like steak more. 29. "RE: OTCC-Baked Penne with Sausage, zucchini and fontina cheese"
I'm planning to make this tomorrow, and in a move that will surprise exactly no-one, I have to make a substitution. I have no Fontina on hand and I'm not going to be at the store until next week. It's the ONLY thing I don't have. Plus, I do have heavy whipping cream that needs to be used really soon. (I even found frozen, shredded zucchini in the freezer from the summer, buried under Mr. Fro's birthday pie blueberries!) So I went fridge-shopping to see what might work. I'm planning to substitute some shredded parmesan for the flavor and cream cheese for the creaminess. I'll probably add garlic, too. We'll see how it comes out. I love Fontina and I'm sure that would be better, but I think this has a shot of working out okay. I have a little chunk of cabbage in the fridge. I admit, I'd never have thought about putting that in there. How was it, Tummy? 33. "RE: OTCC-Baked Penne with Sausage, zucchini and fontina cheese"
I loved the cabbage. I pulled a Fro and used what I had on hand as I wanted to use brussel sprouts but had some cabbage in the fridge. 30. "RE: OTCC-Baked Penne with Sausage, zucchini and fontina cheese"
So yummy! Next time, I will probably only use a 1/2 tsp of oregano, as I'm not a big fan of that flavor, but this is a keeper! I just finished this, and it was a great success. Both Mr. Karchita and myself liked it a lot and went back for seconds. I was concerned about the calories, so I made a few adaptations. I kept the same amount of pasta although with all tomatoes I added, it made 6-8 servings. The sauce became creamy tomato, which was very good. I simmered it for a while to try to reduce some of the water from the canned tomatoes. If I did it again this way, I would have drained off some of that water. I think you could make this without the meat and hardly miss it. I do think the capers added a nice bite, and olives or marinated artichokes would do the same thing. ETA: I also just left the sausages in their casings, sliced into disks. It's easier and I think it looks nice. Thank you, zombs, for a great recipe! Had the same thought about the artichokes. What a great weeknight meal! As I said, I'm in the midst of a fontina love afair, so I think the fontina tang is awesome. I had about 1/2 c. light alfredo from a jar in the fridge, getting old. So, I added a little skim milk to it and used that. Worked great! This will become part of my routine! 36. "RE: OTCC-Baked Penne with Sausage, zucchini and fontina cheese"
I will try to post a picture here, but it doesn't always work. I will definitely put one on FB. There was no Fontina at the store. Go figure. (They must have tossed it with the baggers' carts.) I found Fontinella for $5 for 1/2 pound, which I thought was the same. When I got home and googled it, I found that it's not the same, but it would still work. I also like the taste. I opted for chicken instead of sausage because I'm not a big sausage person. I also subbed spinach for zucchini because it's January, and I added baby bella mushrooms. I think it's pretty darn good, and I can't wait to try it a day later! 39. "RE: OTCC-Baked Penne with Sausage, zucchini and fontina cheese"
Made it again last night, this time only using one zucchini and adding mushrooms, and substituted gouda for the fontina. The mushrooms were a good addition, but I really didn't like the gouda in it. I have a more in depth review with pics but felt that I needed to post DH's response. After we ate this for dinner tonight, we were cleaning up and putting away the leftovers. He grabbed a clean fork and started eating it right from the casserole dish. His qoute? "I could stand here and eat the whole fvcking thing." Let's see. We stuck pretty close to the recipe. 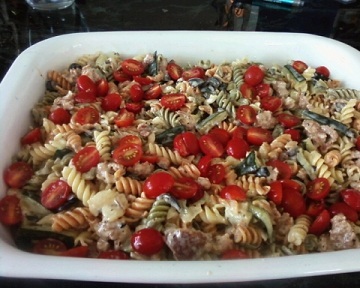 Changes were that we used rotini, cherry tomatoes, white wine, green onions and chicken sausage. I am not a huge fan of sausage but the fontina flavor was wonderful. I swear that DH could have eaten the whole thing. He literally had to pry himself away from it while we were putting the leftovers away. Thanks Zombs!